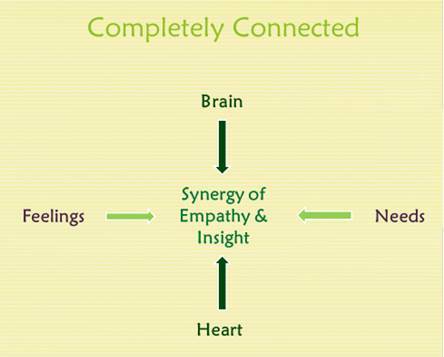 The Connection Practice has been repeatedly recognized for its innovative combination of empathy and insight. Below, on the horizontal line, you see that the language of feelings and needs leads to empathy. On the vertical line, the path connecting the heart and the brain leads to insight. The intersection between empathy and insight creates a synergy that transforms our challenges and enhances our celebrations. Rita Marie discusses the power of empathy in an interview by the Empathy Documentary Project. By naming feelings and needs and by guessing at those of others with whom we are in conflict, we can take the negative charge off the issues that face us. 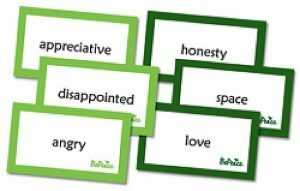 In our courses, we use a deck of 48 feelings and 48 needs cards to help participants identify their own feelings and needs as well as those of the person with whom they are in conflict. The cards often help participants get in touch with feelings and needs they had not previously considered. We offer cards for adults, students and children (referred to as GROK cards for the non-reader) for purchase in our online store. To purchase a deck, please visit our online store here. To learn more about empathy. A student achieves heart-brain coherence and listens for an insight. Heart-brain coherence is the state when the heart, mind and emotions are in energetic alignment and cooperation. It is a state that builds resiliency and helps us access our best intelligence and insights. The Connection Practice uses the emWave software from the HeartMath Institute to teach coherence. In a research study on the impact of coherence on student’s test scores and behavior, 75% of the students who learned coherence experienced lower levels of anxiety during tests. Their scores improved on average -- 10 to 25 points. They experienced less fear and frustration and made fewer rash decisions. 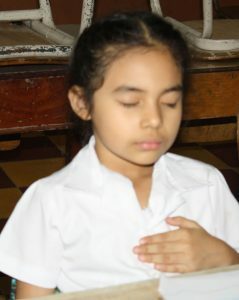 They participated more in class and demonstrated emotional connection, humor, persistence and empathic listening. People of all ages benefit from the insights that flow from coherence. To learn more about insight. And now --- New, magnetic Connection Practice Boards make it easier to learn. Hey Buddy!, I found this information for you: "Empathy & Insight". Here is the website link: https://connectionpractice.org/connection-practice/about/empathy/. Thank you.